This is the best food truck that visits our office building. The lasagna is always wonderful. Butternut squash and the traditional are my favorites. This is the best food truck that visits our office building. The lasagna is always wonderful. Butternut squash and the traditional are my favorites. They will allow you to split the plate... get a 1/2 order of 2 types of lasagna. Also, the salad is always fresh. Did I just pay $13 for this meal? The only time I hit this truck is when the other lines are long. Nice concept, but, the execution is much less than is desired. Maybe 3 stars is generous. There was plenty of noodle...but, not much filling. And the portion was half the height I expect for an $11 lasagna. Flavor was OK...nothing special. Vodka sauce was OK...glad there was enough sauce. I get the sense an Italian is not in the kitchen. Nothing special about the home made pasta...they likely procured the sheets from Wegman's or other local store. Admitedly cooking pasta sheets can be laborious...but, I couldn't detect that they were made from scratch. side salad was very underwelming. spinach and greens with some shaved parmesan with I tiny drizzle of dressing. This lasagna is amazing. I've tried the lobster and the traditional before, and now that it's fall, they have the butternut, and it was SO good. Perfect portion size, plenty of squash in the lasagna, and a pretty tasty side salad. Definitely worth the $12, and definitely going back to get some more next time they're around here! Delicious new food truck! Very friendly and the pulled pork lasagna was awesome, great side salad too, awesome choc amaretto cannoli! Listen, I was originally just as skeptical as you are about purchasing lasagna from a food truck. However, I decided to get over my fear and take the plunge. Wow... not only was this some of the best lasagna I have tasted, it was served with this fancy salad and served with a canoli of some sort. The lasagna was all around scrumptious and I didn't feel that guilty about eating it because of the fresh salad that came with it. This truck is a true winner and the lasagna is worth the $11.00! Eating the food now, and it's outstanding. Portion is good-sized for lunch, and the side salad is excellent...with shaved Parmesan and chopped red peppers on top of mixed greens. The lasagna definitely tastes homemade, and I have already recommended the truck to my coworkers. No exaggeration, no coerced review...just excellent food. Usually beeline to the truck for awesome lasagna, but saw that they only were offering slow-cooked meat sandwiches and platters today. Since I had already been waiting in line, decided to check out the new offerings, and glad I did. Big portions, tender meat, barbecue sauce had some real depth in its taste. The coleslaw was not dripping with dressing (I hate that), and although I am not normally a big fan of black-eyed peas, having them mixed with the rice was a nice combo. Would definitely order the new menu again, but please tell me lasagna is not gone forever! I was turned away today from ordering anything because of this promotional event for CITI. I did not interpret this to mean this food truck was declining anyone else from ordering. Really all I wanted to do was order lunch and I don't need to made to feel like a second class citizen because I don't bank with CITI. I also not pleased with being hassled to join CITI just so I can buy lunch. In your message [tweet] you mention serving lobster, I stopped by this truck and was told your other truck was no longer in service. I don\'t see lobster listed on this truck\'s menu...so why keep mentioning it, if you don\'t serve it. Basil Thyme held a soft opening on June 13, 2011 and is now actively serving in the District of Columbia. Basil Thyme serves fresh from-scratch pasta, lasagna, sauces and dessert. 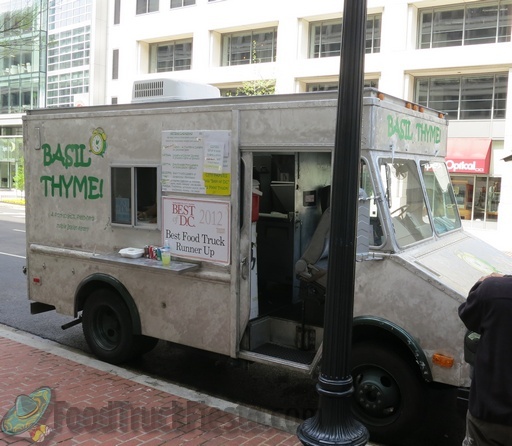 At the end of November 2012, Basil Thyme launched a 2nd truck focusing on pasta dishes. 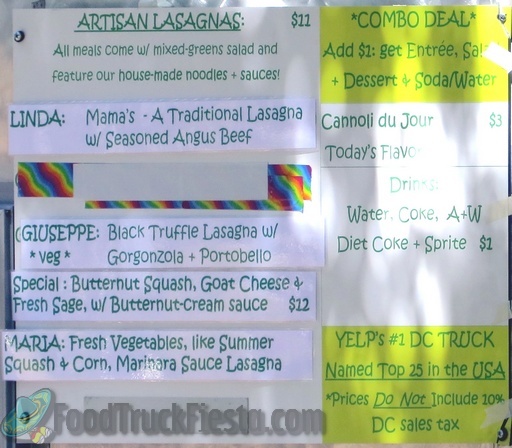 Here are direct links to the menus of the two trucks: Basil Thyme Menu & Basil Thyme’s Two Menu.